LAMAG‘s Spring Event is this Sunday at 2.30pm and of interest to anyone at the interface of religion and the public sector. 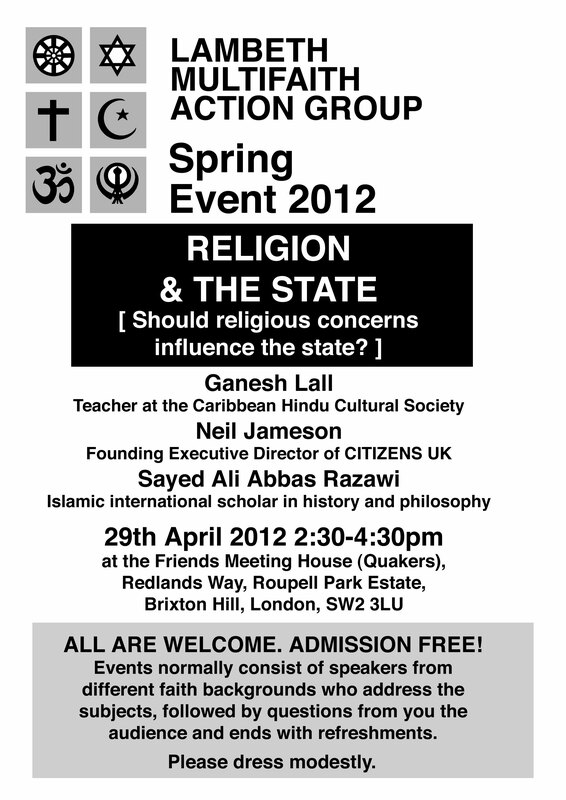 Speakers include Ganesh Lall of the Caribbean Hindu Cultural Society (who has just published a very useful booklet called Hinduism – Some questions answered), Neil Jameson of Citizens UK and Sayed Ali Abbas Razawi, Islamic international scholar in history and philosophy. This entry was posted in Lambeth, Social Labs and tagged Caribbean Hindu Cultural Society, LAMAG by Catriona Robertson. Bookmark the permalink.